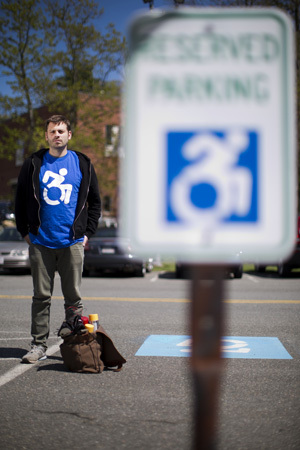 Dr. Brian Glenney, Professor of Philosophy at Gordon College, in Wenham, Massachusetts, helped develop the Accessible Icon as part of the Accessible Icon Project. The icon is a redesign of the International Symbol of Access (also known as the handicap symbol) that shows an active and engaged person with arms in motion. Glenney's research focuses on the philosophy of perception and he maintains active interest in graffiti and street art. The Accessible Icon has been adopted by cities and institutions around the world, including Gordon College, Nissan, New York City, Malden, MA, and others. 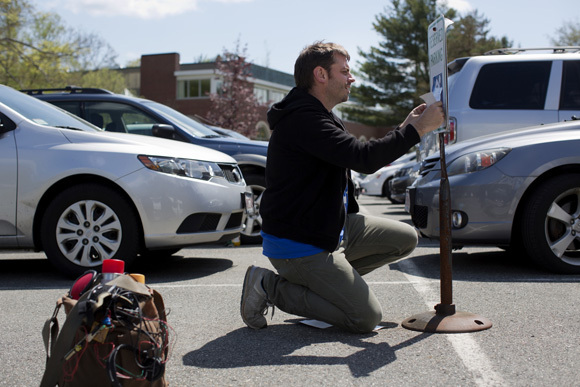 Dr. Brian Glenney, Professor of Philosophy at Gordon College, in Wenham, Massachusetts, applies a sticker with the Accessible Icon to a parking sign at Gordon College. Glenney helped develop the Accessible Icon as part of the Accessible Icon Project. The icon is a redesign of the International Symbol of Access (also known as the handicap symbol) that shows an active and engaged person with arms in motion. Glenney's research focuses on the philosophy of perception and he maintains active interest in graffiti and street art. The Accessible Icon has been adopted by cities and institutions around the world, including Gordon College, Nissan, New York City, Malden, MA, and others. Dr. Brian Glenney (right), Professor of Philosophy at Gordon College, in Wenham, Massachusetts, helped develop the Accessible Icon as part of the Accessible Icon Project. 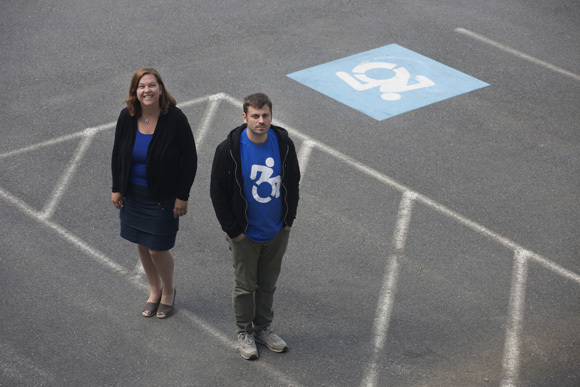 Cyndi McMahon, Director of Marketing Communications at Gordon College, is the volunteer publicist for the Accessible Icon Project and has helped spread usage of the symbol. The icon is a redesign of the International Symbol of Access (also known as the handicap symbol) that shows an active and engaged person with arms in motion. Glenney's research focuses on the philosophy of perception and he maintains active interest in graffiti and street art. The Accessible Icon has been adopted by cities and institutions around the world, including Gordon College, Nissan, New York City, Malden, MA, and others. 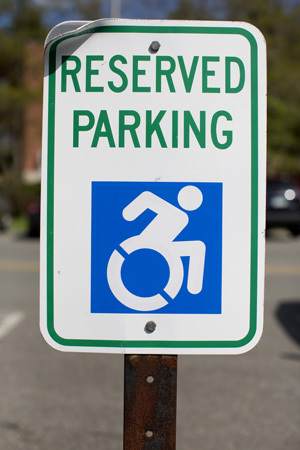 Parking spaces at Gordon College display the current version of the Accessible Icon. The icon, designed by the Accessible Icon Project, is a redesign of the International Symbol of Access (also known as the handicap symbol) that shows an active and engaged person with arms in motion. Glenney's research focuses on the philosophy of perception and he maintains active interest in graffiti and street art. The Accessible Icon has been adopted by cities and institutions around the world, including Gordon College, Nissan, New York City, Malden, MA, and others. 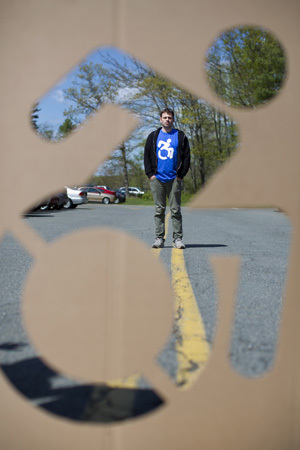 Earlier this summer, I had a quick assignment for the Chronicle of Higher Education to go up to Gordon College and photograph the creators of the Accessible Icon Project, a more active redesign of the International Symbol of Access (also known as the handicap symbol). The new icon, designed by Brian Glenney, has been adopted by New York City and a growing number of municipalities and organizations around the US. It features a more active view of the person in a wheelchair, leaning forward and ready to go. You can see more images at my archive: Accessible Icon Project – Gordon College – Chronicle of Higher Education.